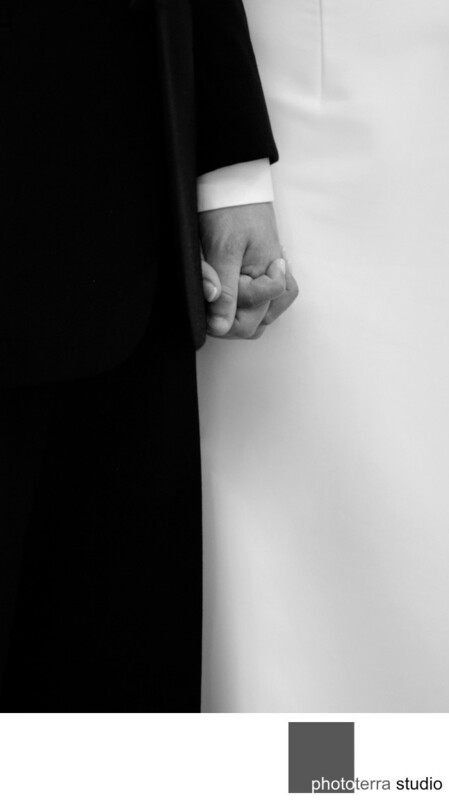 Here we have a bride and groom together, close up, in black and white. I call this image Yin & Yang, after the Chinese philosophical concept. There is a lot of meaning here and this was one of my very first images from when I started photographing weddings. I was proud of this image image back then, and I still am now. It is one of the best minimalistic pictures that I have ever taken at a wedding. For me, it really shows the essence of what marriage is all about. I like in particular the way they have locked their hands and how they fit perfectly into the other just like a key and a lock. There is a lot of symbolism in that, evoking many meaningful ideas. I remember this wedding vividly since it was one of the very first that I photographed. It took place on a rainy day in Sutton, Quebec - a place far away on the outskirts of Montreal, and I remember shooting this image with a 70-200mm Nikon telephoto lens on a D100 body. The Nikon D100 body was actually one of the first professional digital cameras from Nikon. Now this was shot in the church, the lighting was poor, and at the time there was not much happening so I was trying to find something to bring some extra coverage to the ceremony. I have actually tried to recreate this shot many times after, but none were as successful as this one. For me this image is the perfect Yin and Yang of wedding photography: one transforms into another.